Reason 9. Best. Reason. Yet. x]. 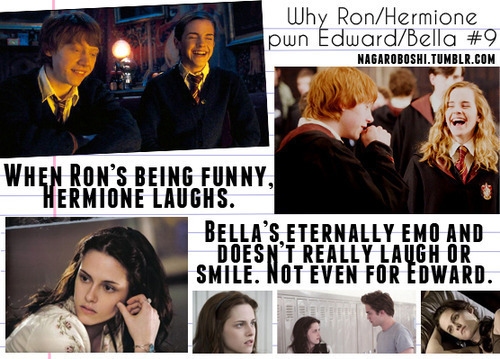 Wallpaper and background images in the 해리 포터 대 트와일라잇 club tagged: hermione granger bella swan ron weasley edward cullen emo. This 해리 포터 대 트와일라잇 photo might contain 신문 용지, 잡지, 타블로이드, 걸레, 신문, 종이, 타블로 이드, 걸 레, 기호, 포스터, 텍스트, 칠판, 사인, 서명, 신사복, and 비즈니스 정장. She does nothing. She is an insult to emo. "Emo" stands for "emotional", FYI.